Will Tel Aviv’s much-needed light rail train, ever, we ask again, ever, come to light? After more than 30 years of planning, and on-off deliberations, Tel Aviv’s own light rail rail line may finally be getting off the ground – that is, if the residents of Israel’s largest city really want it to. Call it what you will, the light tram line, which was originally planned to be a part subway, part above ground rail line – it received the go ahead for the Cabinet to approve a proposal of Ministry of Finance and the Ministry of Transport officials to give the Ministry of Transport responsibility for the Red Line of the Tel Aviv light railway, and to finance the project from the state budget. The line has been talked about ever since the mid 1960’s, and was originally inaugurated during the administration of Prime Minster Levi Eshkol in 1967, with the Shalom Meir Tower, the city’s first skyscraper, being the main station. But it’s been more talk than action over the last years. After a long hiatus, largely as a result of the 1973 Yom Kippur War, and its aftermath, the project once again resurfaced in the 1990’s and a second project inauguration occurred during Prime Minister Binyamin Natanyahu’s first administration at another location on HaRekevet Street, on the corner of what is now known as Yitzhak Rabin Avenue. After this second inauguration ceremony, the project was again put on the back burner and has remained there until recently when new interest has again brought it to the forefront, as noted in a recent Haaretz article. 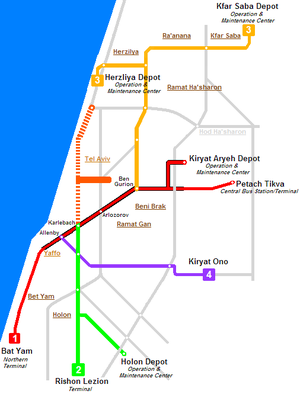 The metro Tel Aviv area, which includes a number of satellite cities such as Petach Tikva, Ramat Gan and Givatayim, Bat Yam and Holon, will be fed primarily by the Red Line, which will begin at the main bus station in Petach Tikvah, and end at the Nisenboim station in Bat Yam, for a total distance of 22 km. This line would have 33 stations, 10 of which originally planned to be underground (the underground portions are still in dispute, however). The other primary line, the Yellow Line, would begin in both Kfar Saba and Herzliya, and end at Ben Gurion Blvd in central Tel Aviv. This line would be 18 km in length and will link up with the cities of Raanana, Hod Hasharon, Herzliya, Ramat Hasharon, Ramat Gan, and Holon. The Red Line will be first installed, the Yellow, Blue, Green, and Purple lines to follow at later dates. The line will be similar the one being finished in Jerusalem; and which recently conducted a successful test on the Capital’s Strings Bridge. Perhaps as a result of the still ongoing light rail project in Jerusalem, one that has had parts of the capital’s main commercial districts torn up, and local merchants literally put out of business for long periods of time, many Tel Avivians wonder if it would be worth it to go through similar agonies for the sake of having this method of inter city public transport, in spite of the advantages it might have over noisy and polluting bus lines. The Tel Aviv municipality has also started a plan to ban trucks from entering the city during certain hours. The pilot truck ban program will go into effect on January 1, 2011 and will ban trucks between 6am – 9am. The roads effected include the major highways leading into Tel Aviv (highways 4 and 5 and route 20) as well as the coastal roads. Tearing up central Tel Aviv to build a project that will take several years to complete is not everybody’s cup of tea, especially those who live and work inside the city. It now remains to be seen if the above government entities can come together to make the project turn into actuality. Aside from this issue, there is also the matter of the city residents themselves being in favor of this project. After all, they will have to live with the daily inconveniences of the construction, as the residents and business owners in Jerusalem have had to do for so long. Will The Tel Aviv Light Rail Ever Happen? Do We Want It To? This is in the end, the project may not take off at all. But the mystique of a subway in Tel Aviv is sure to continue. I recall my first night in Tel Aviv,way back in October, 1974, when after spending a couple of weeks riding the subways in Manhattan, I thought the underground passageway at the corner of Allenby and King George was the entrance to a subway system. Boy was I wrong! Back then, buses were not the comfortable, air conditioned ones they are now. They were old Leyeland ones with wooden seats and bars on the windows. At least some aspects of the city’s public transport system has changed, even if there are still no subways or light trains. It’s important to note a couple of things. First, the Red Line’s new timetable sees it being completed in 2018. Factor in the inevitable delays and complications, and that means it won’t be up and running until at least 2020-2022. That means that in 10+ years, we will have just one light rail/subway line (out of a planned network of 7 lines). Also, a recent decision to change the digging system means that during those 10 years major streets will become construction sites for the light rail. In other words, we are about to set off on the same path that effectively paralyzed Jerusalem for the better part of the last decade. After the trauma caused by building just one line of the planned light rail network, the residents and shopkeepers in that city raised such a fuss that it was decided to abandon light rail technology in favor of bus rapid transit (BRT), which is cheaper, quicker and less disruptive to the city, but functions just as well. Haifa decided to go with BRT at the outset, and their project has thus far been the most successful. Amman, Jordan is building a BRT system as well. Why put residents of metropolitan Tel Aviv through the same agony that Jerusalem suffered, when chances are that sometime in the future a decision will be made to switch to BRT in any case? In fact, things are already moving in this direction. 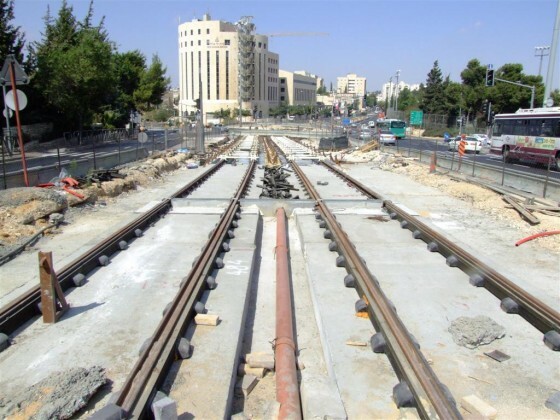 After the Tel Aviv light rail project collapsed this year, resulting in the decision to nationalize the project, it has begun to dawn on our decision-makers that they have no plan whatsoever for alleviating traffic chaos in the near term, over the coming decade or so. Thus, a number of interim solutions have begun to take shape, including a reform of the bus system, building (and enforcing) a network of dedicated bus lanes, a couple of BRT lines (mainly outside of Tel Aviv proper) and setting up a metropolitan transit authority. In the meanwhile, the officials involved are mainly busying themselves with mutual accusations and passing the buck. And that is the real reason for the persistent traffic jams – the dysfunctional political system and its inability to solve real problems.